Remember the good old days when I used to spend a whole weekend birding various locations across Wales? If not then I don't blame you as I'm struggling to do so myself. For various reasons this year, the weather being one and life being another, I just haven't been able to enjoy the same freedom as I've been used to. The result has been an ever increasing sense of frustration with a few snatched hours here and there having to suffice. On the odd occasion that I have had a whole day free I've been more concerned with walking a decent distance to keep fit than hunting around to see what birds I can find. This weekend I'd had enough and finally gave in to my withdrawal symptoms. Yes the forecast was once again horrendous but this time I was not going to be beaten. 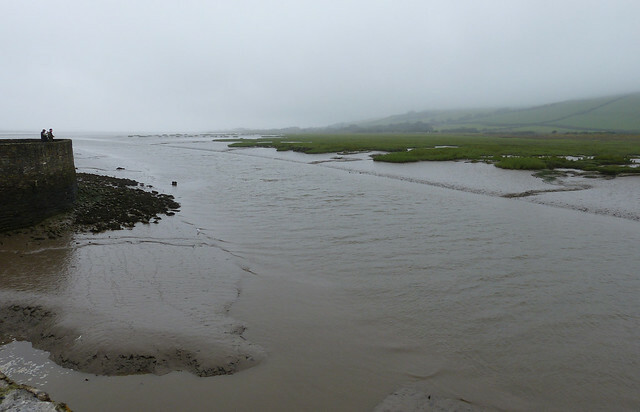 Come Sunday morning I was to be found stood on the wharf at Kidwelly Quay with a blanket of cloud barely above sea level and a fine rain blasting horizontally into my face. It may sound bleak but I couldn't have been happier, for spread out before me in the expanding mudflats were hundreds of Redshank in a feeding frenzy. I lost count after 155 with the birds still continuing in every direction for as far as the eye could see. Dotted amongst them were fourteen Curlew and a single female Teal, whilst out towards the Burry three Little Egret and a pair of Grey Herons were standing sentry. Right beneath us a Black Headed Gull was providing great entertainment as it first battled with and ultimately ate a small crab, quickly followed by a worm that any fisherman would have been delighted to use as bait. In the small car park I was very surprised to find a still occupied Swallows nest amongst the rafters of a dilapidated metal shed. Both parents were making regular visits with food but surely it can't be long before the chicks fly. Speaking of fledging it has obviously been a good year generally for the local Swallow population with at least thirteen young birds sat on the nearby telephone wires. Up towards the sewage farm (oh yes we are going to all the glamorous locations today) I was disappointed to find just a Magpie family on the filtration beds. Normally this is a prime location for Reed Buntings and other small birds, but apparently not this time. Fortunately the surrounding vegetation made up for it with at least three juvenile Chiffchaffs, one Goldcrest and a male Blackcap sheltering from the weather. Next stop was Pembrey harbour, scene of many a successful Tern watching experience. As the tide had been dropping rapidly for the last couple of hours I expected most, if not all, of any gathered birds to have long since dispersed, but it seemed our luck was in. Out on the furthest sandbank we picked up a flock of 74 Sandwich Terns with a single Common Tern sat slap bang in the middle. With the rain intensifying we made a quick retreat to the car, grabbed a bite to eat and continued on to Sandy Water Park. As I set off for a quick loop of the lake I had to pass an angry group of over thirty Mute Swans who were clearly unhappy that I was not going to be feeding them. Out on the water things initially looked pretty quiet with just the usual Tufted Ducks and gulls for company. A family of Great Crested Grebes with two large but still striped ducklings spiced things up, but it was left to a small brown bird to really get my juices flowing. A flash of brown alerted me to the presence of a Reed Warbler, remarkably my first of the year for a species that I never seem to have much luck with. Needles to say I broke the news to Emma who had stayed with the car in typically sympathetic fashion. A brief pause on Llanelli foreshore revealed another 220 Redshank before we arrived at the local WWT reserve. By now the rain had stopped and the sun was even trying to put in an appearance, so it was with new vigour that we started scanning the water in front of Goodall's Hide. Eleven roosting Greenshank were a pleasant surprise, as was the recently arrived flock of Wigeon. With another flock of Wigeon on the NRA scrapes accompanied by twenty Lapwing and even more Teal, it would appear that autumn is definitely with us. Speaking of the scrapes there have apparently been three juvenile Garganey there for the past week, but try as we might we couldn't find them ourselves. They were probably roosting in the long grass but even out in the open I may have struggled to pick them out. Why can't we have a stonking male rarity instead of juveniles? It would make life far easier. Fortunately the long staying Spoonbill stood out a mile amongst the roosting Cormorants, as did yet another gathering of 150 plus Redshanks (who knew we had so many!). A final treat came in the shape of a Buzzard devouring some unidentified but most definitely deceased creature.